If you haven't had enough of camera resolution wars, Canon has developed an image sensor with a resolution of 250 megapixels. The 19,580 by 12,600 pixels in the APS-H format sensor, measuring about 29.2 millimeters by 20.2mm, constitute the highest pixel count for a CMOS sensor smaller than full-frame 35mm size, the company said. The resolution is 125 times full HD video, about 30 times 4K video and some 7.5 times 8K, a format with 7,680 by 4,320 pixels that will be used in regular broadcasts in Japan in 2018. Improvements in signal processing and circuit miniaturization give the sensor a signal readout speed of 1.25 billion pixels per second. The sensor can also capture high pixel-count video at five frames per second. The sensor was mounted into a prototype camera and was able to capture images in which the lettering on a plane flying some 18 kilometers away can be made out. The stunt involved optical and digital zooming, as well as magnification of a very small area of the photo. Canon's new sensor was mounted in a prototype camera, seen here with a EF35mm f/1.4 USM lens. 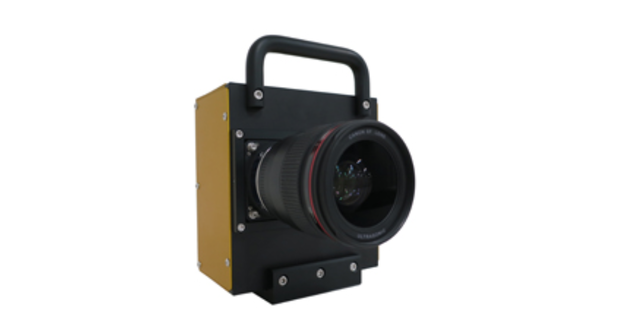 The new sensor follows Canon's development of a 120-megapixel CMOS sensor in the APS-H format in 2010. "We realized there was a certain amount of demand in the video production and instrumentation fields for even higher pixel counts, which provided us with the impetus to start developing a 250-megapixel sensor," a Canon spokesman said via email. The company doesn't see any potential for consumer applications of the technology because it would require exceedingly high optical performance to take advantage of the resolution's potential. Canon envisions potential business uses for the sensor in surveillance, crime prevention and high-resolution measurements. Security cameras have become a focus for Canon amid wilting demand for compact digital cameras, once a mainstay product. Earlier this year, it acquired Swedish security camera maker Axis communications and recently announced it will launch a security camera next year with an ultra-telephoto zoom lens and an F-value of 2.4 that can grab color imagery in near-darkness.